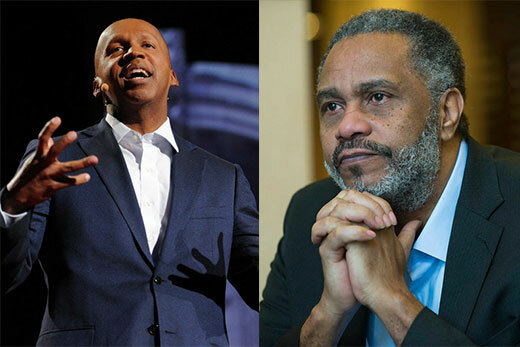 Bryan Stevenson (left) and Anthony Ray Hinton will be in conversation on the American legal system, mass incarceration and social justice at a public event Oct. 26 at Emory. Alabama-based Civil Rights lawyer Bryan Stevenson, creator of the Equal Justice Initiative and the Legacy Museum in Montgomery, Alabama, and author of the best seller, “Just Mercy,” will give a public talk about the American legal system, mass incarceration and social justice at 7:00 p.m. Friday, Oct. 26 at Glenn Memorial Auditorium. 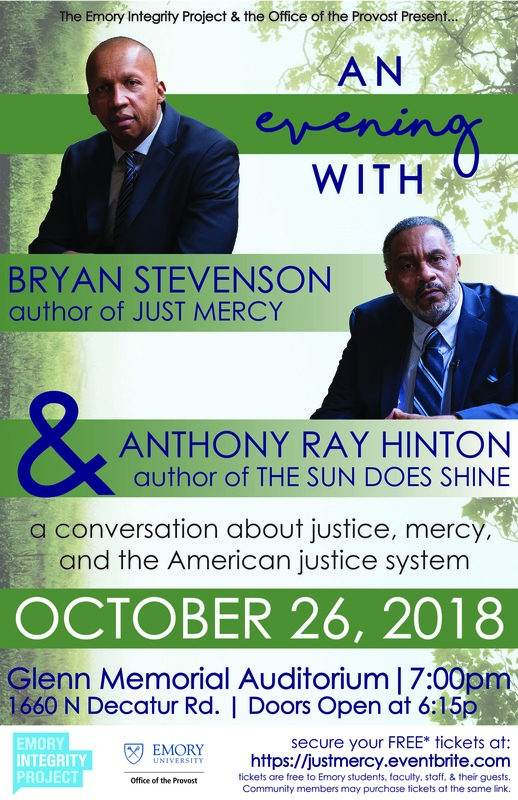 Stevenson will be in conversation with Anthony Ray Hinton a former client of Stevenson and author of “The Sun Does Shine,” who served 28 years on death row before having his conviction overturned in 2015. Stevenson and Hinton are being hosted by the Emory Integrity Project (EIP) and Emory’s Office of the Provost as part of the EIP’s Common Reading Program, an initiative that provides an opportunity for all incoming first-year students to engage in meaningful conversation through a community ethics narrative. Stevenson’s memoir, “Just Mercy: A Story of Justice and Redemption,” which details the true story of Walter McMillian, a man sentenced to die for a crime he did not commit, is Emory’s 2018–2019 Common Read book. In 1994, Stevenson founded the Equal Justice Initiative, “a legal practice dedicated to defending those most desperate and in need: the poor, the wrongly condemned, and women and children trapped in the farthest reaches of our criminal justice system,” according to its website. In addition to his work as a Civil Rights attorney, Stevenson founded the Legacy Museum in Montgomery, Alabama, which displays the history of slavery, racism and mass incarceration. The event is free for all current Emory University students, faculty and staff, and $20 for non-Emory affiliated community members. To RSVP, visit justmercy.eventbrite.com. For additional inquiries, contact Erin Mosley at erin.mosley@emory.edu.